‘Wake up, genius.’ So begins Finders Keepers, King’s instantly riveting story about a vengeful reader. The genius is John Rothstein, a Salinger-like icon who created a famous character, Jimmy Gold, but who hasn’t published a book for decades. Morris Bellamy is livid, not just because Rothstein has stopped providing books, but because the nonconformist Jimmy Gold has sold out for a career in advertising. Morris kills Rothstein and empties his safe of cash, yes, but the real treasure is a trove of Moleskine notebooks containing at least one more Gold novel. Not since Misery has King played with the notion of a reader whose obsession with a writer gets dangerous. Finders Keepers is spectacular, heart-pounding suspense, but it is also King writing about how literature shapes a life – for good, for bad, forever. 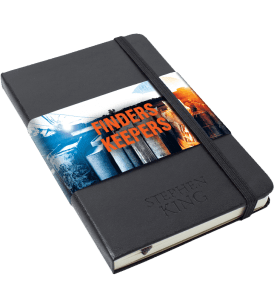 To celebrate the publication of King’s gripping new book we’re giving you the chance to win one of 10 Finders Keepers Moleskines. To enter our giveaway just answer one simple question and sign up to the Stephen King newsletter. This competition is open to UK & Ireland, Australia and New Zealand residents and closes on June 28th 2015. Read the full terms and conditions here. By clicking submit and entering this competition, you agree to sign up to the Stephen King newsletter.